It’s hard to believe we are already through January as it seems like the holidays were just yesterday. Those prone to motion-sickness are still recovering from last year’s market plunge, while others are busy getting on with their New Year’s resolutions and rekindling relationships with their fitness clubs. What was December’s market action trying to tell us? Have we reached the end of this cyclical expansion? We think not. While it clearly looks like we have crested the economic peak of this latest market cycle, reasonable growth prospects remain ahead of us before we move into a contractionary phase. 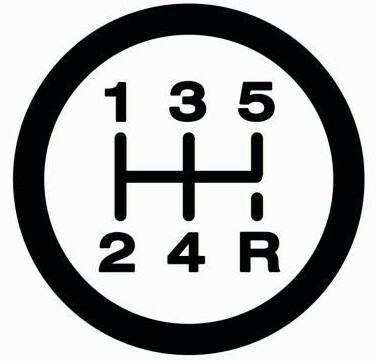 An analogy that comes to mind would be one of downshifting from fifth gear to fourth gear, which is a distinctly different environment of going from fifth gear straight to reverse. It’s clear that economic growth is slowing and evidence of this trend is presenting itself all over the planet. Downticks in housing, slowing auto sales, wobbly CEO confidence and flattening yield curves all suggest continued deceleration. These are natural byproducts and lagged effects of the Fed’s monetary tightening cycle, which can take years to work its way through the global economy. 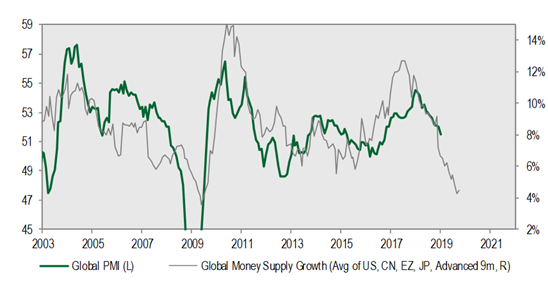 Global money supply growth, which tends to lead global Purchasing Managers’ Indexes (PMIs) by nine months, sits at near 2009 levels. Slowing economic growth will eventually lead to slowing earnings growth, and indeed, we are seeing lower guidance and fewer earnings beats in Q1 of 2019. That said, we still have full employment, benign inflation and a softening stance by the Fed as we approach interest rate equilibrium. In our opinion, China is the 2019 wildcard. 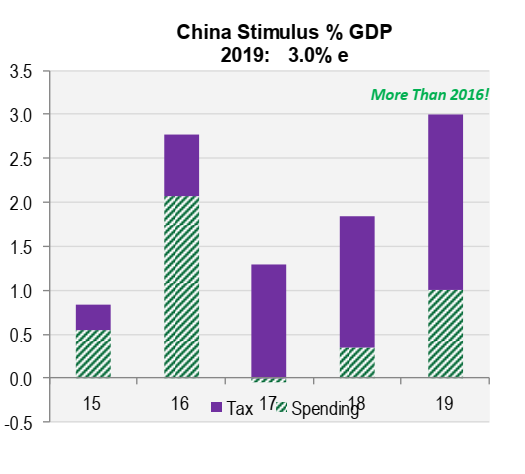 Will their massive stimulus efforts revive slowing global growth? Last time in 2016, it did. Fighting the Fed and the People’s Bank of China often proves to be a losing battle. 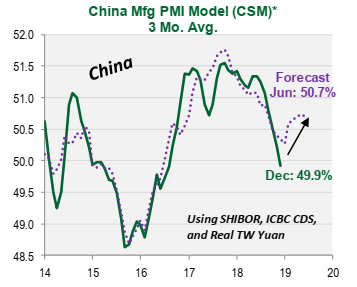 Stated another way, a Fed pause and Chinese growth spurt could be powerful catalysts to extend the cycle a little further. 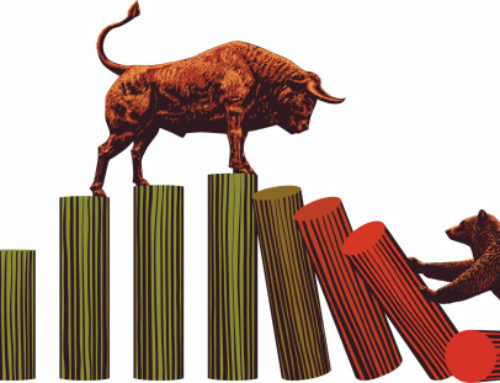 We expect this to be a volatile year as markets try to sort out these opposing dynamics. The fundamental backdrop is still very positive…although slightly less so. Initial earnings reports are still pretty good…but not quite as good as last year. Downshifting, not stomping on the clutch and dropping into reverse. So what to make of this January rebound? 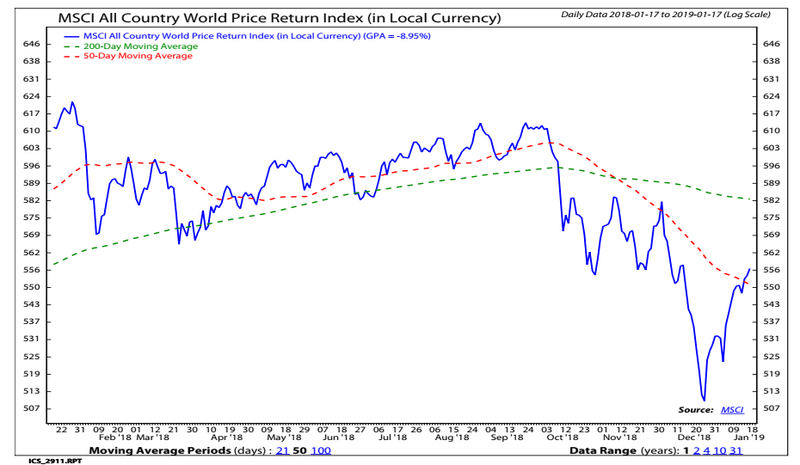 Our sense is that more rational pricing is coming back into the markets as last year’s selloff proved to be an overreaction given the moderating, but still positive fundamentals. However, this is a time for caution as we expect a retest of the December lows. In fact, of the last 5 of 6 non-recessionary bear market occurrences since 1966, a retest of a market bottom has occurred. We expect this retest to hold as the economic data firms, the Fed pauses, and China stimulus begins to take hold in global markets. So far, our recent portfolio additions of Emerging Markets, Real Estate and Gold appear to be confirming this outlook as they are performing well into the nascent year. 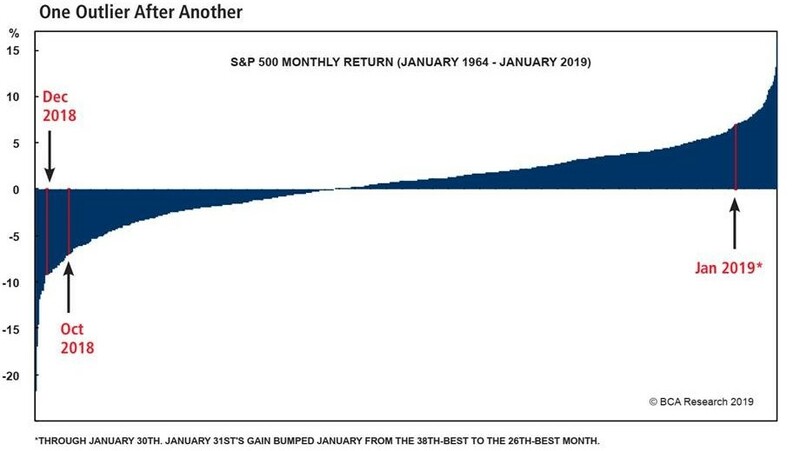 If our base case proves correct, 2019 would suggest a period of outsized equity returns as the markets begin to enter a final expansionary phase as we continue to downshift and move towards economic contraction. As always, we continue to watch the data to help shape our worldview and resulting portfolio allocations. In any case, 2019 is a year to be cautious, opportunistic and nimble.